Hawaii Electric Boat Tours provides the only zero emissions boat tour in Hawaii. 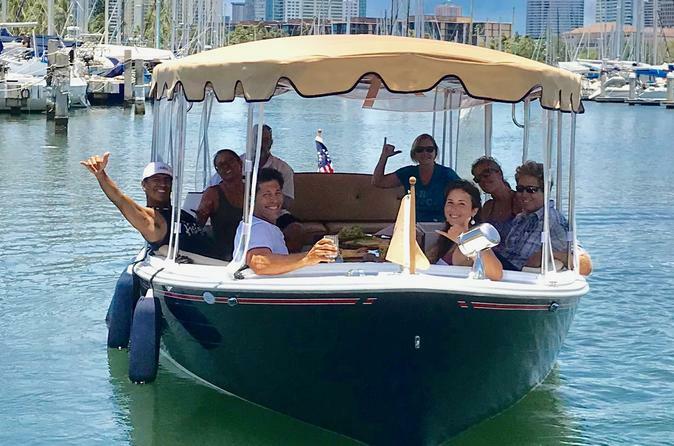 Our electric boat takes guests up the Ala Wai Canal and around the harbor (Tide permitting) to see another side of Waikiki during the Ala Wai Harbor and Canal tour. The boat trip lasts 90 minutes which includes snacks and beverage of your choice, wine, beer, soft drinks and water. Cruising silently through calm waters with the Captain giving you highlights of what we pass and some history of the area. We leave the dock opposite the Harbor Masters office (73 Holomoana Street) at 10am. After the Captain has given the safety information. Snacks are served, pretzels, chips, nuts, crackers etc and your beverage of choice including wine, beer, water, and sodas. We pass to the back of Waikiki on the starboard side, outrigger canoes going by, then under the 2nd bridge with the Ala Moana Golf course on the left, onto the third bridge with a view of Koko Crater in the distance and canoe clubs on the banks as we turn around to come back up the Ala Wai Canal. Once through the Canal we continue on to tour the Ala Wai Harbor, with the Captain giving the guided tour, pointing out interesting boats and landmarks, such as the boat "Splendor" the trawler that Nathalie Wood died on.